Crystalline water, clean white sand beaches. Towering palm trees waving in the tropical breeze. Sun-dazzled days and starlit nights. Constant year-round trade winds cooling our lush island. This is St. Thomas, an American paradise peppered with pulsating Caribbean ambiance. It's the crossroads of the Caribbean, a place where "mañana" often reigns amidst the bustle of commerce. Pack your curiosity along with your swimsuit. Look beyond the luxury and peaceful relaxation of your vacation villa and see what makes St. Thomas tick. But don't forget the reason you're here - to unwind and enjoy and bake in the sun. > Spend your days at any one of our many palm-fringed beaches, rising from your beach chair or towel only to paddle about in the azure sea. Use a mask and snorkel to spy on the exotic undersea world that surrounds St. Thomas. Or don a scuba tank for an adventure down into the deep. Sail or Windsor to any of the offshore cays that dot the horizon, or practice your putt at our seaside Mahogany Run Golf Course. Roam the narrow streets and alleys of Charlotte Amalie, a sophisticated city that since the 1600s has enjoyed her share of travelers. Take a few minutes from your search for that perfect piece of duty-free jewelry or that hand-woven basket to absorb a bit of the island's history. The old stone buildings that now house an almost unimaginable array of merchandise once served to store the necessities of a plantation economy. Slaves were auctioned in Market Square at the spot where island farmers now sell their fresh produce, Camille Pissaro, born above one of the Main Street stores, left a legacy found in the plethora of Caribbean art for sale here. > Trek up the 99 Steps to Blackbeard's Hill where you will find Crow House, now a private residence, but when Denmark ruled the Virgin Islands, the home of several governors. Directly above are Blackbeard's Castle, built by the pirate Edward Teach, and the old Lutheran parsonage. St. Thomas has any number of cosmopolitan, four-star restaurants, many of them open to the tropical breezes and the view. But don't forget to sample the native cuisine - fresh, local fish and dishes like fungi and kallaloo. Take the ferry to St. Thomas' sister island, St. John - an island 20 minutes in time but light years away in ambience. Explore the pristine beaches of the Virgin Islands National Park, which occupies a full two-thirds of the island, or poke around in any one of the artsy shops that line the streets of Cruz Bay, St. John's only town. Just 40 miles south of St. Thomas lies St. Croix, the largest of the Virgins. Renowned for its rich historical, architectural and cultural charm, St. Croix has scores of ruins and restorations of sugar mills and plantation great houses everywhere, and there are walking tours, hikes, and horseback rides that meander through this historic past. Not as mountainous as sister islands St. John and St. Thomas, St. Croix's topography and landscaping is varied, from rolling hills to lovely, uncrowded beaches and arid cactus-covered plains, to a lush, green rain forest. An influx of people from the United States and the southern Caribbean islands has created a Creole-accented and calypso-beat American Paradise. A smile and a friendly greeting will open the door to our special brand of Caribbean hospitality - Welcome! 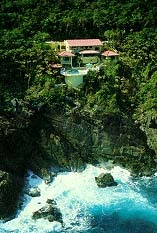 You can now browse our exclusive on-line villa catalog consisting of over 70 deluxe properties in the USVI! If you can't find what you're looking for you can either call or e-mail us. Did you know that we also have villas on the BVI, St.Maarten/St.Martin, St.Barts, Anguilla and some other Caribbean islands?